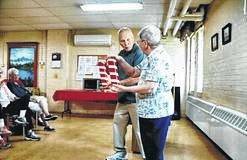 GALION — Local magician Rich Henry performed a magic show last week at the Golden Age Cente. During the performance he gave a brief history of magic, dating to medieval times. Henry also shared information about the role Galion played in the Brotherhood of Magicians and some of the early men who gathered together to learn magic. There were plenty of oohs and aah during the performance.